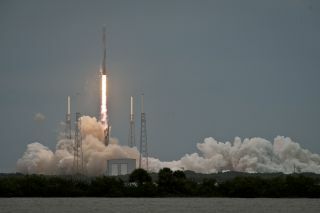 A SpaceX Falcon 9 rocket launches an unmanned Dragon cargo capsule toward the International Space Station on the company's third delivery flight for NASA on April 18, 2014. SpaceX will launch its fourth cargo mission for NASA on Sept. 20. People in the eastern United States have an opportunity, weather permitting, to see SpaceX's robotic Dragon capsule launch on a cargo mission to the International Space Station early Saturday morning (Sept. 20). The Dragon space capsule will launch into orbit atop SpaceX's Falcon 9 v1.1 rocket at 2:14 a.m. EDT (0614 GMT) on Saturday from Florida's Cape Canaveral Air Force Station. As was the case with NASA's space shuttle launches to the station, Saturday's launch will travel nearly parallel to the U.S. East Coast. That means the glow from the Falcon 9's engines should be visible in varying degrees along much of the Eastern Seaboard. You can watch the Dragon launch in live webcasts provided by NASA TV and SpaceX. NASA's webcasts will begin at 1 a.m. EDT (0500 GMT), with SpaceX's webcast beginning about 20 minutes before liftoff. So while the Falcon 9's first stage should create a fairly conspicuous light in the sky, the second stage will likely be considerably dimmer. Dragon is launching on SpaceX's fourth cargo mission to the space station. The company holds a $1.6 billion deal with NASA to make 12 such flights. In the southeastern United States, the Falcon 9 should be readily visible thanks to the fiery output of its nine first-stage engines. The light emitted will be visible for the first three minutes of the launch out to a radius of about 500 miles (805 kilometers) from Cape Canaveral, or an area about three times the size of Texas. But the spectacle won't be as dramatic as that provided by NASA's now-retired space shuttle, which was much bigger and whose solid rocket boosters shed hot, glowing-white aluminum oxide in the accompanying exhaust and smoke trail. The Falcon 9 engines burn kerosene and liquid oxygen, which aren't as bright. But Falcon 9 rocket launches are generally more luminous than Atlas 5 rocket launches, which would be the closest comparison. Depending on the location you're viewing from, the Falcon 9, might become visible anywhere from just a few seconds after launch up to perhaps three minutes after it leaves Cape Canaveral. After the first stage shuts down, the rocket will put out only the light from its single second-stage Merlin 1C engine. At that time, the Falcon 9 should appear as a small, pulsating, fast-moving star that will shine with a yellowish-orange glow. People who remember sighting the brilliant glow of the space shuttle as it raced along the Atlantic Seaboard on its way to orbit may be disappointed when looking for the Falcon 9. Still, it might be worth the attempt to try and see what might be seen. Mid-Atlantic region: Look toward the south about three to six minutes after launch. Northeast: Concentrate your gaze low toward the south-southeast about six to eight minutes after launch. For most viewers, the Falcon 9 will appear to skim the horizon, so be sure no buildings or trees obstruct your view. Because the rocket likely will appear rather small and dim, scanning the sky with binoculars might help. If the weather is clear, keep in mind that the Falcon 9 likely will appear to move very quickly, much more quickly than an orbiting satellite, due to the rocket's near-orbital velocity at low altitudes (30 to 60 mph, or 48 to 97 km). It basically travels across 90 degrees of azimuth in less than a minute. And, of course, before you head out to look for the rocket, make sure that it has actually left the launch pad. Live coverage of the launch will be available here at Space.com, courtesy of NASA TV.